Hrs: 1200-0400Z++ MON-FRI, 1300-2300Z++ SAT-SUN, CLSD HOL. OT BY NOTAM. Hrs: 1200-0400Z++ MON-FRI, 1300-2300Z++ SAT-SUN. OT BY NOTAM. Hrs: 0400-1200Z++ MON-FRI, 2300-1300Z++ SAT-SUN. OT BY NOTAM. APCH/DEP SVC PRVDD POTOMAC TRACON (PCT) APP/DEP CON 135.625/269.625 (MON-FRI 0400-1200Z, SAT-SUN 2300-1300Z. OTHER TIMES BY NOTAM). 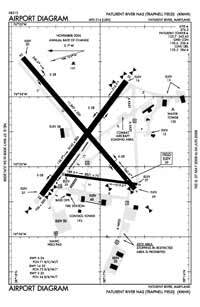 TA31 PAR LCTD AT LAT 38-17-14.947N LONG 076-24-30.821W. A110-1 JASU: (GTC-85) (NCPP-105) (NC-8) (NC-10). A110-10 NS ABTMT: MIL ACFT MAINT AT LEAST 1500 FT BTN 3 NM AND 10 NM FR 210 DEG CW TO 240 DEG. NO PRACTICE APCH 0300Z++ TO 1200Z++ MON-FRI, SAT BEFORE 1500Z++, SUN BEFORE 1700Z++. TRAN ACFT PRACTICE APCH NOT TO INTERFERE BASIS. A110-11 CSTMS/AG/IMG: LTD TO ACFT ON OFFICIAL BUSINESS AT PAX RIV WITH 72 HR PN. CTC AODO AT DSN 342-3836, C301-342-3836. A110-12 MISC: WX FCST SVC AVBL 0900-0100Z++ MON-FRI. FOR FCST SVC ALL OT CTC FWC-N AT DSN 565-4555 OR C888-745-6899. WX OBSN AND PMSV MTR AVBL 1100-0400Z++ MON-FRI AND 1200-2300Z++ SAT-SUN. A110-13 FOR CD WHEN NHK ATCT/APCH ARE CLSD CTC POTOMAC APCH AT 866-640-4124. A110-2 FUEL: 100LL, A, J5. A110-3 FLUID: SP LHOX LOX. A110-5 TRAN ALERT: AVBL 1200-23000Z++ MON-FRI EXC HOL. A110-6 REMARKS: OPR 1200-0400Z++ MON-FRI,1300-2300Z++ SAT-SUN, CLSD HOL. SEE FLIP AP/1 SUPPLEMENTARY ARPT RMK. A110-7 RSTD: PPR-NO NOTAM TRML FAC AVBL. DSN 342-3836, C301-342-3836. ACFT MUST MAKE PRIOR ARNG AND RCV PPR FR HOST SQUADRON, OR NAS AIR OPERATONS. LTD RAMP SPACE, AND LTD TRAN SVC AVBL EXPECT DELAYS. TWY ALL EXP DLY DUE TO ACFT WT LIMITATIONS. A110-8 CAUTION: STOPPING IN RSTD AREA ON TWY A, W TWY IS PROH. PORTIONS OF RWY, TWY AND ACFT RAMPS NOT VIS FR TWR. FIRST 1630 FT. RY 32 MAY BE CLSD DAYLT HR MON-SAT DUR VFR. BUILDINGS AND EQUIPMENT ARE LOCATED NEAR THE APPROACH END OF RUNWAY 32. DEER AND BIRD HAZ. A110-9 TFC PAT: VFR INITIAL AT 4 DME (RWY 32 AT 3 DME) 2000', BREAK 1500', DOWNWIND 1000'. REDUCED RWY SEPARATION STD IN EFF FOR LCL BASED USN/USMC ACFT. A81-APT AVBL ONLY DURING HRS OF OPERATION. Standard 2,400 Foot High Intensity Approach Lighting System With Sequenced Flashers, Cat. I Config.